Day 6 is the trip to Pamukkale and Hierapolis. 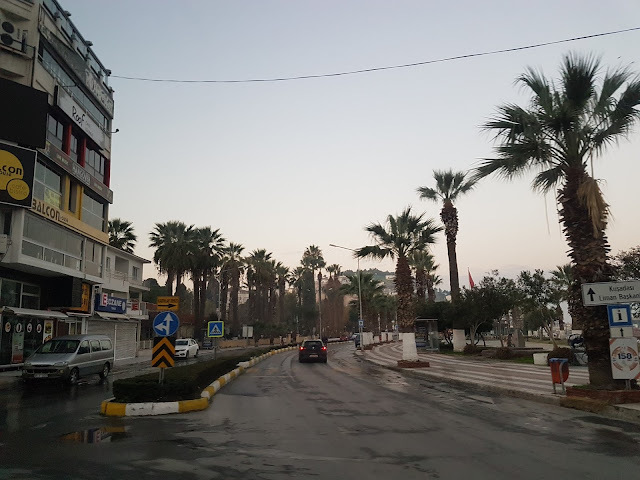 I also briefly visited the resort town of Kusadasi. We left Pamukkale for Selçuk. I'm still bummed about missing the paragliding ride. 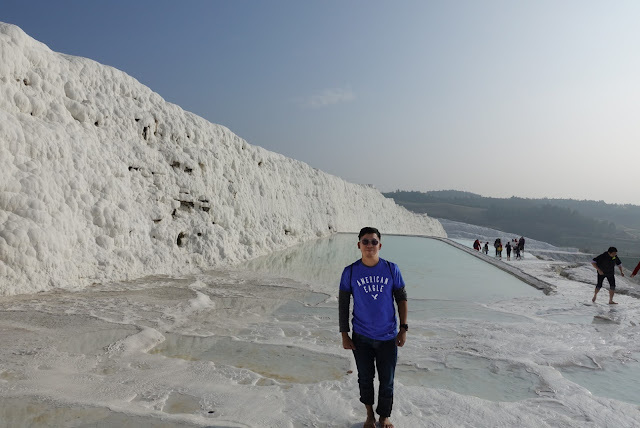 So the main event - the visit to the Pamukkale travertines. Pamukkale means cotton castle in Turkish - and the description fits very well to the white, chalky formaton that covered the whole side of a mountain. The formation was from the accumulation of carbonate from the hot spring water that flows to it. The view was surreal - almost alien. The water is in all shades of blue and steam can be seen to rise from it. The water is mostly lukewarm, but some pools have frigid water! I got in after removing my shoes. I joined the throng of visitors, snapping pictures and doing a live Facebook video. I gingerly navigate between the narrow channels of water - trying not to slip. At some point I did, while taking a video with my RX100. Luckily I landed on my feet, with no damage to my limbs not the camera, only to my pride. There was also a curious experience for me in the travertines. A guy gestured to me that he wants a picture of me and him. I relented even though I find it funnily weird. To reciprocate I also took a picture of us. I really don't know what was that all about. I spent and hour at the travertines then I headed to the entrance of the complex. There I met a paraglide pilot who offered a ride, but I had to decline because the bus is leaving soon. 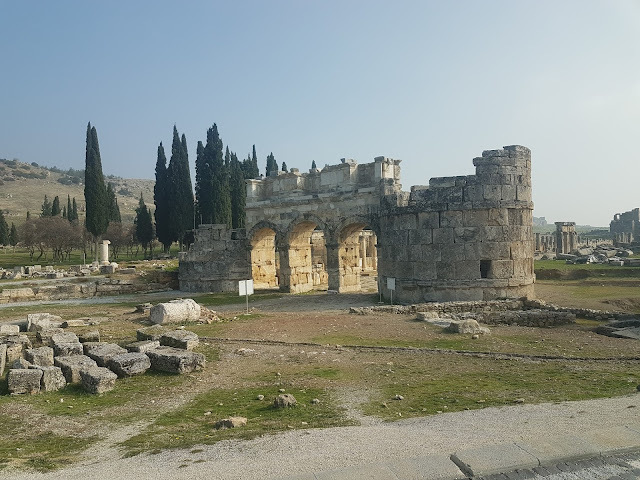 The first part of the tour is exploring the ancient town of Hierapolis. It's a bit smaller than Ephesus, but it has a wide boulevard and a very expansive necropolis. The town was built adjacent to the travertines, and it has a lot of pools and fountains. Cleopatra was said to have visited Hierapolis many times to bathe in its curative hot springs. There was also a theater although not as large as the one in Ephesus. I think it is better preserved though. 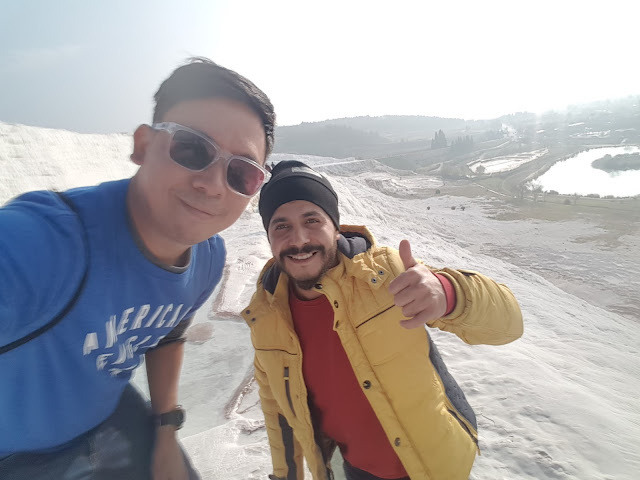 At this point Halik, the guide, told me that he wasn't able to arrange a paragliding ride for me, which bummed me to no end. We arrived at the town just before noon. We pass by a jewelry shop first. It specializes in onyx, fossilized stone, and sultanite gems. I bought a pair of sultanite earrings for my mom). 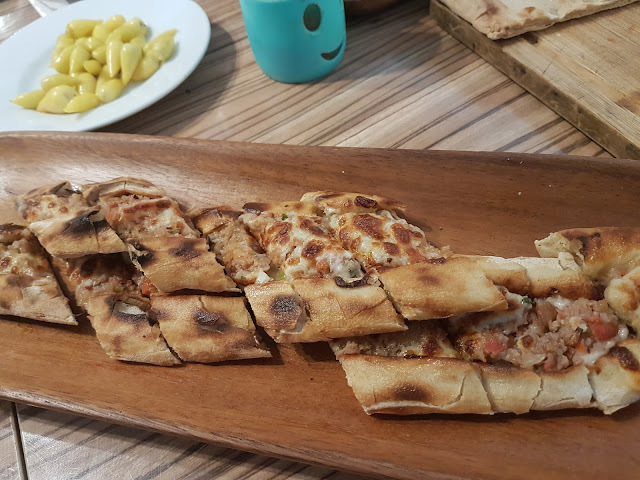 Then we had lunch - soup, salad, and Turkish pizza - at a local kefeterya. The pizza was good. Kusadasi is a resort town along the Aegean Sea. It's actually good that we're making a sidetrip there; at least I was able to see the place. We set out for Denizli after picking up the Pakistani family (same from yesterday's tour), and another from Malaysia. Along the way we stopped for coffee, sandwiches and bathroom break at a local coffee shop. By the time I got out the door, the man from tour company was outside, and the Malaysian couple was already in their office. After waiting for a few minutes we set out for the trip. We will be picking up two more families in Kusadasi.